Earlier in the year, Lt(N) Drake (left, foreground) led a casualty treatment exercise onboard MV Asterix. LS Stowell (right, foreground) applies a blood pressure cuff while MS Peer (left) and MS Robillard (right) look on. Toothache while at sea? Naval Replenishment Unit (NRU) Asterix can take care of that. Since the decommissioning of the last Auxiliary Oiler Replenishment vessel in 2016, the Royal Canadian Navy (RCN) has been without a ship-borne dental clinic or dental officer. 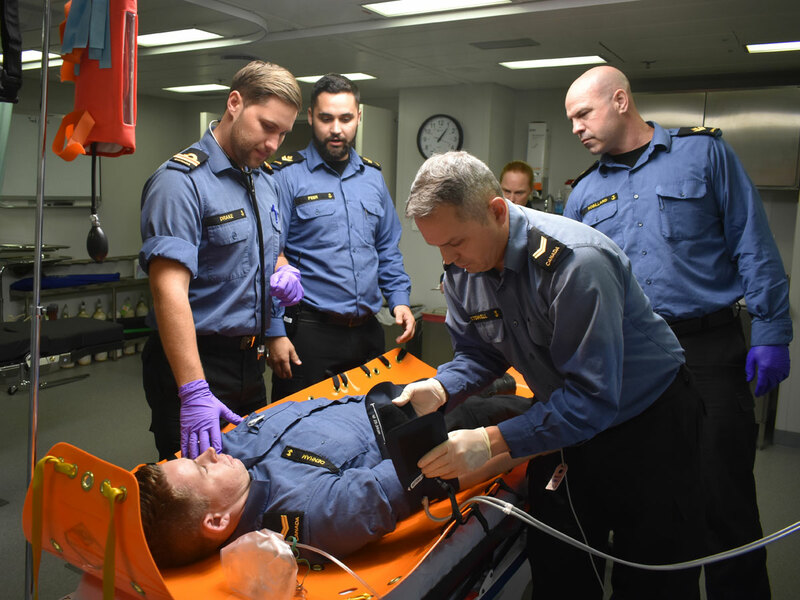 With the launch and deployment of Asterix in January 2018 and its embarked Canadian Armed Forces personnel, the RCN has re-established full medical and dental capabilities while at sea. On the medical side, NRU Asterix employs a physician assistant, medical technician, and a medical officer. A doctor onboard, with their expanded scope of practice, allows for a greater ability to treat the many ailments that sailors may encounter over the course of their deployment. The medical officer also acts as the senior medical authority for the ships sailing in consort with MV Asterix, affording medical teams onboard nearby Canadian Patrol Frigates sound and timely advice. The ship also has portable x-ray and ultrasound equipment that further enhance capabilities when a medical radiography technician is embarked. Asterix features a well-designed and capable medical facility. In addition to two offices/examination rooms, there is a trauma bay, a five-bed hospital-style ward, x-ray suite and pharmacy. The trauma bay is designed to allow for a surgical team to embark and perform surgeries onboard, giving the platform further mission-specific capabilities. Asterix is also capable of responding to humanitarian aid and disaster response operations. In terms of dental services, MV Asterix features a full dental operatory, complete with a dental x-ray, sterilization and dental lab space. On board, a dental team comprised of a dental officer and dental technician can provide a wide range of dental treatment while at sea. Whether it is simple fillings, tooth extractions or root canals, the dental clinic is able to perform almost all of the services sailors would expect from a shore-based clinic. Being able to provide dental treatment at sea makes the fleet more operationally effective as sailors no longer have to endure dental problems until the next port. As Asterix continues its operations in the Pacific and around the world, both Canadian sailors and allies can rest assured that NRU Asterix’s medical and dental teams are ready to help.